The author is a retired researcher, born in 1944 and currently 68 years old. After retirement, I established a start-up company NuSAC, venture company No. 55 of Tokyo Institute of Technology. I investigate nuclear energy technologies, and am currently recommending decontamination technologies for Fukushima Prefecture. One could call me an old researcher. 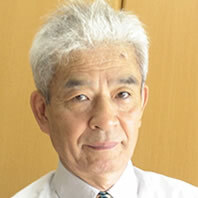 I engaged in the research of nuclear power generation at the Central Research Institute of Electric Power Industry (CRIEPI) from my entry in 1976 until my retirement in 2006. My areas of specialization included the nuclear fuel cycle and fast reactor systems. My topic today is about the fast reactor, a nuclear reactor with a degree of safety higher by an order of magnitude than a light water reactor. Many who hear this may be incredulous at first, but read on and learn more. Commercial nuclear power plants in operation around the world today employ light water reactors. These reactors use enriched uranium as fuel and water as the coolant. Relatively straightforward fabrication and inexpensive plant construction costs led to their construction around the world. Unlike a light water reactor, a fast reactor exploits high-speed neutrons generated by nuclear fission. Neutron sources are plutonium and uranium. Liquid sodium metal is used as coolant. I will leave the details to descriptive documentation available elsewhere, but note in passing that fast reactors can arrange fuel in high density, which means compactness and favorable heat efficiency per unit reactor volume are the resulting benefits. The fast reactor described here is not a fast breeder reactor like Monju, which is located in Tsuruga, Fukui Prefecture. Although the system is largely unchanged, such as sodium used for coolant, the fuel format is completely different. Monju fuel is an oxide, but this fast reactor fuel is uranium alloy (U-10wt% Zr alloy). I call it metallic fuel here. Metallic fuel has a large thermal conductivity that can efficiently transfer heat to coolant (approximately 10 times greater than oxide fuel). Thus, for two nuclear reactors generating the same amount of heat but with different fuels, the average temperature for metallic fuel during operation is significantly lower than for oxide fuel. This fact means that the overall calorific value of metallic fuel during operation is small. When an accident occurs and the fuel cannot be cooled, fuel and coolant temperatures rise according to the heat they contain. The temperature elevation of metallic fuel remains low, however, and in effect prevents fuel damage. By exploiting this characteristic, under a severe accident where fuel cannot be cooled, the dangers of a nuclear reactor meltdown can potentially be avoided. In the accident at Fukushima Dai-Ichi Nuclear Power Plant, the pumps for cooling the reactors with seawater were damaged by the tsunami and did not operate. Elevated fuel temperatures led to meltdowns, and explosions of generated hydrogen blew up the reactor buildings. Argonne National Laboratory (ANL) in the U.S. made the first pronouncements regarding the safety of metallic-fuel fast reactors. Receiving orders to investigate this effort, I encountered the fast-reactor design concept that featured astonishing safety characteristics. My theme became the research and development of fast reactor systems employing metallic fuel, and this work continued for nearly 20 years up until my retirement. Here, let me describe the methods ANL employed to verify certain safety characteristics. A little over 26 years ago on April 3, 1986, a safety verification test was performed under public disclosure. A genuine metallic-fuel fast reactor (EBR-II experimental fast reactor, U-Zr alloy fuel, Idaho, U.S.) was employed to verify and prove the characteristics called passive safety and inherent safety. The established test conditions were demanding, a combination of the severest conceivable conditions for an accident unlikely to actually occur. In other words, the conditions contemplated a massive earthquake strike that would thwart insertion of control rods to the EBR-II reactor operating at full power (i.e., a scram failure), and thus prescribed a lock on the control rod scram system. At the same time, the cooling system for decay heat was locked for a failure scenario, and the power supply system from the emergency diesel generator was shut off. Finally, the operator shut off the external power supply system. When the Great East Japan Earthquake struck, all of the nuclear power plants that registered the earthquake, including Fukushima Dai-Ichi, successfully completed their scrams and the control rods were inserted to their prescribed positions. 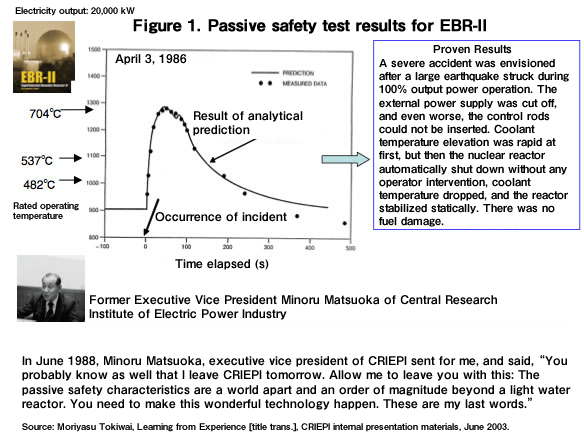 In comparison, the EBR-II test was quite telling in the extra-severe conditions that were assumed. As shown in Figure 1, these severe conditions were invoked at 0 seconds, when the nuclear reactor was exposed in a helpless state: namely, the creation of arduous conditions that combined a scram failure, total loss of power, and failure to continue cooling the reactor core. A severe accident was envisioned after a large earthquake struck during 100% output power operation. The external power supply was cut off, and even worse, the control rods could not be inserted. Coolant temperature elevation was rapid at first, but then the nuclear reactor automatically shut down without any operator intervention, coolant temperature dropped, and the reactor stabilized statically. There was no fuel damage. Source: Moriyasu Tokiwai, Learning from Experience [title trans. ], CRIEPI internal presentation materials, June 2003. How did the test progress for the EBR-II? The results can be found in Figure 1. The horizontal axis shows the elapsed time (seconds), and the vertical axis provides the measured temperature (Fahrenheit) of coolant sodium at the reactor core outlet. Retained heat and decay heat caused coolant temperature to rise suddenly; however, after reaching a peak (below the boiling point of sodium), the temperature dropped and the reactor statically stabilized at the rated operating temperature. EBR-II accomplished two tests simulating two types of severe scenarios in a day. Researchers from CRIEPI attended these tests, and were amazed at the utter self-confidence and certainty regarding passive safety held by ANL. Following on these events, CRIEPI decided to participate in the ANL program in 1989, and established the Metallic Fuel Laboratory. I became the head of this lab. For a period of three years lasting until 1996, I was in residence at the EBR-II site, and learned about ANL’s philosophy of safety. With respect to Figure 1, the curve with the solid line is a plot of the predicted temperature readings according to temperature analytical codes. These analytical codes refer to the tool for predicting the constantly changing conditions of the nuclear reactor through calculations. The varying temperature and degree of thermal expansion of the various reactor core parts are described by equations, which calculate the influence on the nuclear reaction. The static stabilization at low temperature as predicted by the analytical codes was a superb achievement in tracking conditions over a time span measured in seconds in an actual nuclear reactor where complex effects interact. The predictive method of analytical codes was validated with a real reactor and found to be sufficiently reliable. Analytical codes were also employed at CRIEPI to study many reactor core design concepts. Regardless of nuclear reactor output, metallic fuel was found to afford passive safety for small reactors and large reactors. Last year on March 11, 2011, although automatic scrams did engage at Fukushima Dai-Ichi Nuclear Power Plant Unit Nos. 1, 2, and 3, cooling performance failure resulting from external power loss and emergency power failure resulted in extensive fuel damage, fuel meltdown, and release of radioactive substances into our environment. In terms of whether a massive release of radioactive substances occurred or not, the high degree of safety for a metallic-fuel fast reactor should be convincing. Japan seems to have a thought process at its foundation where problems tend to be grouped under a single word. I consider this singular manner of discussion to be quite precarious. For example, the government and media have grouped the fact reactor discussion under Monju. This has trivialized the debate over fast reactors into a shallow, budget or no budget issue. Monju suffered a sodium leak in its secondary system in December 1996. Since then, it has remained inoperative for a long period of time. As a taxpayer, I cannot tolerate the massive waste of tax money. But I cannot agree with the tenor of debate that groups the sodium leak accident with the safety of fast reactors and then declares that safety is the issue. But this type of over-simplified debate can tend to happen in any country. EBR-II made large contributions to the advancement of nuclear technologies, but ceased operations in 1994. Currently, it is in the midst of decommissioning. A successor reactor has not been built. I analyze the situation at a macro level as follows. The fast reactor means the creation and usage of plutonium, which is also material for nuclear weapons. Thus, the deployment of fast reactors will require technology and an international framework that further assures the non-military application of plutonium. ANL was already acutely aware of this need, and had developed a completely new reprocessing technology to make application of any plutonium to nuclear weapons significantly difficult. The technology causes the inevitable admixture of impurities to plutonium during the dry reprocessing of metallic fuel. In the 1990s, however, the highest political priorities consisted of the reduction and dismantling of nuclear weapons, as agreed to between the U.S. and the Soviet Union. The dismantling of nuclear weapons required enormous budgets. Suppressing nuclear development in countries in opposition to the U.S. like North Korea and Iran arose as additional political challenges. The Clinton administration of the U.S. consequently decided to stop research and development on fast reactors. ANL strongly asserted the need to apply dry reprocessing technology, since the decommissioned EBR-II unit would have spent metallic fuel. ANL’s assertions were recognized, and several tons of metallic fuel have been dry-reprocessed to date. I believe that maintaining this dry reprocessing technology, a U.S. original invention, was considered to be in line with the future benefit of the U.S., instead of abandoning it. My analysis ends here. Although technological development has continued in resource-poor Japan and France, the Fukushima Dai-Ichi accident in Japan has led mostly to voices calling for the termination of fast reactor development. With the end of the nuclear race between the U.S. and Soviet Union, the ensuing period of reducing nuclear weapons has ironically crimped the development of fast reactors that exploit plutonium for peaceful use. The possible paths ahead for science and technology, including nuclear energy, are infinite in their choices. For the future of humankind, people who would categorically deny the use of nuclear energy as an option seem to be a minority. In addition to development of safer light-water reactor technologies, nuclear energy holds much potential. I believe that retaining and advancing technologies associated with metallic-fuel fast reactors and dry reprocessing align with the national interests of Japan. Right now, we need to calmly reconsider past decisions and stop insisting on infallibility, do we not? As I recall the safety of the fast reactor demonstrated through the verification tests of EBR-II, I feel that Japan needs to reevaluate the fast reactor, especially because of the experience of Fukushima Dai-Ichi. The previous notion that demanded the fast reactor as a solution to the future depletion of uranium resources should be cast aside. Instead, we should conclude that the fast reactor is the desired solution for a safer nuclear reactor. The issue is not the amount of budget, but a fundamental understanding. I keep wondering why Japan cannot take a step forward in a clear-cut direction? The fast reactor can fulfill a role that a light water reactor cannot through the beneficial use of plutonium generated by light water reactors, and stands out with its high safety and its economy—even at small scale. My happiness would grow immeasurably, if this column increased the number of people, even just a few, who learned about the potential for the fast reactor and its safety, which is unlike anything heard about before.